“*%^&%£** Mick they are amazing!!! You really captured the feeling of the day thank you so much. I know my mum will be really over the moon that you got so many of her looking great and you can’t tell she wasn’t feeling so well on the day – so a big heart felt thank you for that. So…there you have it. More happy clients! Booked me to be their Styal Lodge Wedding Photographer, from London where they live, but were married ‘back home’ (for Charis) in Cheshire. Paul’s clan travelled over from Northern Ireland to make it a very special, family-biased wedding. I say biased, because daughters Erin and Ciara played a major part in Charis & Paul’s celebrations…as they did back in Summer (oh no- where did the Summer go!!?) for their Engagement Shoot…sorry, Family Shoot. Styal Lodge was bustling on the morning of the wedding – Sarah, Neil and the team from Pink Pepper were quietly preparing the Lodge and the stunning food to come, and the first thing to greet me that morning was their 24″ x 20″ signature board. With memories of the F-Shoot on that hot Sunday, the as yet untouched framed image was proudly on display in the entrance. I was impressed. 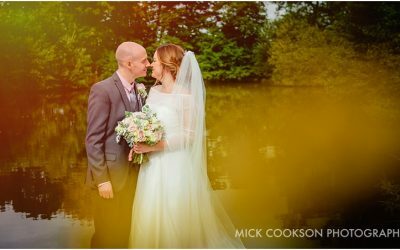 If you’d like to see more of my Styal Lodge wedding photography, why not get in touch?